"A lot of times the work professionals do to advance their careers is not documented in a way they can share their accomplishments with peers, potential employers and existing employers," said Veronica Diaz, director of online programs for Educause, the association for higher education technology professionals. "We think badging for professional development purposes is kind of a no-brainer." Typically, a digital image of a badge displays the name of the course and the date it was completed. More importantly, badges have links that can lead people to data and information about how and when a badge was received. They can be displayed on social media platforms like LinkedIn, Facebook and Twitter, allowing users to supplement their résumés with evidence of particular skills. Educause can point to hard data that badge use is growing among its constituency: In the first 11 months of 2014, the association issued 2,563 badges to individuals who completed some kind of educational program it produced, with 41.4 percent of the individuals accepting them (in other words, opening and sharing them with others). That represents a 5-percent increase over the 2013 acceptance rate. Now a handful of colleges and universities are starting to experiment with the concept of badging for professional development as well. Some of their efforts are so recent, it's still hard to evaluate their success. Nevertheless, initial anecdotal evidence appears positive. 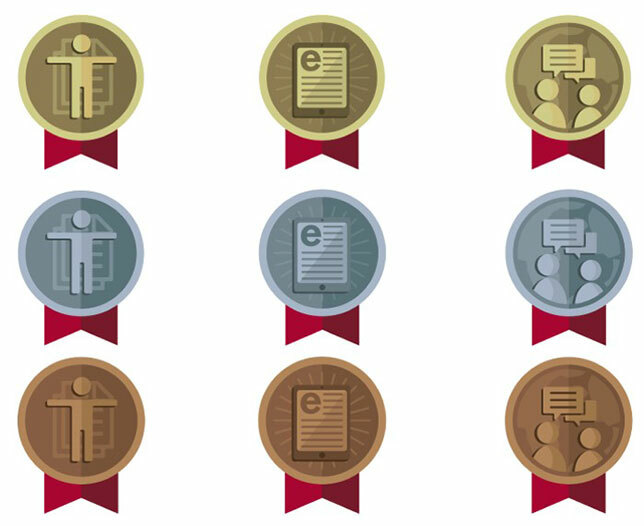 An advanced-level badge, for those faculty members who have demonstrated broader implementation, undergone formal peer review or shared their expertise beyond the institution. "When we started thinking about this a year ago, we knew it had to have a rigor attached to it so that faculty would perceive it as having value," said Anastasia Morrone, Indiana University's associate vice president for learning technologies. The plan is to create additional types of badges for faculty members who become more proficient with learning technologies and to support various types of noncredit achievement by students. Only months into its new badging initiative, Indiana University has yet to accumulate enough data to evaluate its success. Nevertheless, Morrone said, "People seem to like the model. The hope now is that we'll get to a place where people will use it in their annual faculty reports [in which they document their academic activities for the year]." In the spring of 2013, the staff members at the Center for Excellence in Teaching and Learning (CETL) at Texas Wesleyan University were not happy with the number of faculty and staff who were taking advantage of their programs. That semester they had just 98 people, out of a combined university faculty and staff of about 500, participate in a workshop or one of their other programs. They did a few things to change that, including moving from a program that focused on workshops at set times to a more consultative approach that involved one-on-one meetings with staff members, often in their workplace and on their own schedule. However, they also implemented a fairly intricate badging system that gives points for everything from attending workshops and visiting the CETL office to social media activity and presenting at CETL workshops. They even created an online leaderboard so faculty and staff could compare their professional development activities with those of others. The programs seemed to work. In the fall 2013 semester, the CETL more than doubled participation in its programs to 200 people, and did almost as well the following spring with 184 participants. During that academic year, the center issued 164 badges. A survey at the end of the school year found that 75 percent of faculty had participated in at least one CETL program. More than 83 percent of those who completed a survey said they liked the badging initiative and would consider implementing it in their own programs. Not everybody was really that excited about the leaderboard and competing with their peers to complete professional development. "And the awarding of badges seemed to some people like it was juvenile," Pope said. Morrone found the same thing at Indiana University. "The term badge, the word itself, seems to have different meanings for different people," she said. "That word is something you might think about if you do this yourself." While there seemed to be growing appreciation for some kind of digital certification tool, both Pope and Morrone agreed that badging needs to be framed in a way that's acceptable to higher education faculty members. As Pope explained, "They told us, ‘We're adults here. We don't need badges.'" Still, pointed out Educause's Diaz, badges can be helpful, especially as professional development itself takes on new shapes. "Badging, or whatever you want to call it, gives people a portable, assurable mechanism to talk about what they're doing," she said. "It's really important as it relates to new subject areas where there might not be formal coursework or degree programs." For instance, Educause in recent years has expanded its offerings in learning analytics. "That is an emergent area and you might not be able to get a degree in it yet," Diaz said, "but you might be able to go out and take several courses. A badge would show progressive learning in that area."